I 've got two words to say to you, and they are... Bart Simpson. That yellow haired freak has got a lot to answer for. OK, so the Simpsons is still the funniest cartoon I've ever sen in my life. That's fine, but we the general public were constantly bombarded with hype and merchandise. Merchandise like Bart alarm clocks, Bart bubble bath, Home hair spray, stickers, badges, T-shirts, etc etc. I could go on for about six pages. The mischievous one even brought out a single and an album, both of which were absolutely abysmal. The computer industry latched on to the fact that anything to do with the Simpsons was selling like hot cakes, thus ensuring plenty of software for your home computers and consoles. The first effort to raise it's ugly head was Bart vs the Space Mutants and apart from the amazing cartoon introduction there wasn't a lot to be said about it, apart from that it was a fairly standard platform romp and quite a sorry affair. Then with a crack of thunder, the Simpsons phenomena died down. No publicity, no news, no nothing. The kids had turned their beady little eyes to something else as they so often do. The gaming news had also gone to an early grave, but slowly and surely there was a revival starting to happen. Bart's Nightmare had made a few waves and caused a big splash with its outstanding graphics and sound on the Super Nintendo. Meanwhile on the Sega Megadrive, a cartridge had stated to sell very well. It's name? Krusty's Super Fun house. The game wasn't as much to do with Bart Simpson as the others, Krusty's is more a spin-off, rather like A Different World when compared to the Cosby Show. As die-hard Simpson fans will know, Krusty is a clown who looks similar and is just as psychotic as the clown out of Stephen King's It. He's also Bart's hero. Krusty has his own TV show and appears alongside Itchy, Scratchy and Sideshow Bob. The plot behind the game is simple. Krusty is in trouble because rats have invaded his fun house and are beginning to run riot. He has to guide the rats to the deadly traps controlled by Bart, Homer and other such Springfield favourites. Easy? Nah, not very! 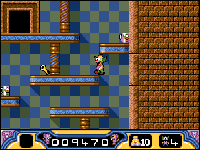 Krusty's Super Fun House is a mixture between a platform and a puzzle game. The puzzles vary, but the object ultimately is to kill the rats. The killing changes with each level. The rats can be zapped with electricity, burst like balloons or squashed like tomatoes. It's all in good cartoon fun though, so the RSPCA and Mary Whitehouse can stop complaining and relax. Not only does Krusty have to splat, squash, blow up and burst the rats, he also has to beware. Dotted around the place are slimy snakes, pink flying pigs, and laser firing aliens all of which are in league with the rats and will do Krusty some damage if he goes to bear them. What possible weaponry could Krusty have? Machine gun? Knives? Flame-thrower? Inter-continental Ballistic Missiles? Hey! - Krusty's a clown, so the red nosed one is armed to the teeth with custard pies. Very lethal. Will Krusty's Super Fun House Fall down or has it good foundations? Overall, it's an excellent puzzle/platform game. The graphics are great and to tell the truth I can't tell any difference between the Amiga and the Megadrive version. The same goes for the sound. Those with a musical ear should, err write to Esther at That's Life. Krusty's is very simple, but some of the levels are downright fiendish. Control method is no problem - even my dog could play it. It's quite addictive for the first few days, but a month after purchase if you have a choice between Krusty's and something else you might just pick something else instead. The price is a bit steep at just under 30 - perhaps Acclaim still thinks it's the Sega version. If you're looking for something to tax your brain a bit and you're feeling pretty flysh then look no further than Krusty's, well at least until Lemmings 2 comes out. Aye Carumba dudes. Wonderful graphics identical to the Sega version. The tunes are a bit annoying, but can be turned off. Simple, but fun to play and easy to control. Quite addictive, but beware - it's tad expensive. Ask any Simpsons fan and they will tell you it's not just Bart, Lisa, Homer, Marge and Maggie (the main characters) that make the show worth going to a BskyB-owning friend's house to watch. It's the subsidiary characters too; people like Itchy 'n' Scratchy, and Krusty the clown. Well, now there's a game based on the latter character, Krusty's Super Fun House is a good-looking, nicely through-out platform game which would be able to keep the most jaded of gamers on their toes for a while. The first point to bear in mind here is that you should not judge the game by the ease of level one - and boy oh boy, is it easy. This is just a test level which you get acclimatised to the control system and a few of the puzzles and tricks that will assault you in later levels. In fact, the way in which the levels are set up is nicely through-out too. You move Krusty about a few platforms, each of which contains a number of doors. Simply stand outside a door, soak in the strangely menacing music, press the fire-button and in you go to one of the sub-levels. Then all you have to do is to play a kind of reverse Troddlers/Lemmings in which you have to lead a bunch of rats to their deaths at the hands of a major Simpsons character. Like Troddlers you have to make use of blocks to achieve this aim. Unlike Troddlers you have to search for these blocks along your way - and this search becomes more difficult with the later levels. A Simpsons spin-off that looks excellent and has some neatly thought out levels too. Killing the rodents is not the end of the level though. Once this is done, you have to search for some power-ups and hidden levels. Once all this is cleared up, you exit the level, and the door is locked behind you. Lock all the doors, and move up a level. "Easy? Ha, ha, ha!" Nope! Even though Krusty can leap twice his height and pick up loads of ammo, you will be foxed by the puzzles that build up and up. The game looks excellent, there's some great use of colour and neatly designed levels, but it's let down by strange parallax scrolling and (once again, when will programmers get this right?) poor collision detection. Time and time again we see Krusty hanging off the last pixel of a platform; certainly he does a well-animated wobble as he hangs there, certainly he looks worried, but even more certainly he shouldn't be in the position in the first place. 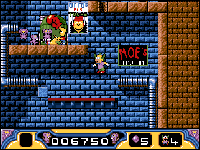 Despite the moans Krusty's Super Fun House is a mightily enjoyable piece of Amiga gameplay. Once you've got over the initial amazement that Krusty himself can outleap Bob Fosbury from a standing start, you will find yourself coming back for more and more. Another decent off-shoot of The Simpsons! The in-game music is distinctly strange, almost worrying, which makes up for the lack of in-game sound effects. Graphically it's very, very impressive. Don't be fooled by the first level, it's very eacy but it's only a teaser. Easy control method makes the puzzlesolving on later levels fun to do. Nach dem Gruselhammer "Alien 3" liefern die Konsolisten mit diesem "Freudenhaus" bereits ihren zweiten Amiga Titel ab, wobei es sich erneut um eine Konvertierung vom Mega Drive handelt. Ob der Plattformspaß nun mehr Laune macht als Oceans Simpsons-Versoftung, bringt allerdings nur eine Reise in die Heimatstadt der Trickfilm-Sippe ans Licht - auf nach Springfield! Dort sind derzeit die Mäuse los, denn nervige Nager haben Krusty's Zuhause gestürmt und machen jetzt das gesamte Gebäude unsicher. Hilfsbereit wie Zocker nunmal sind, übernimmt der Spieler die Ungeziefervertilgung und... doch halt, was haben Bart und der restliche Chaos-Clan eigentlich damit zu tun? Zu diesem Zweck liegen Werkzeuge verstreut, die sich jeweils einzeln aufsammeln und benutzen lassen: Mit Rampen werden unüberwindliche Mauern erklommen. Vasen dienen als Transportbehälter, und Rohre zur Reparatur der Mäuse-Absaug-Einrichtung. Oft läßt sich eine Kleintierfamilie nur durch Kombination mehrerer Tools ins Verderben locken, so daß ohne ein bißchen Knobelei wenig vorangeht. Freilich kommen auch und gerade Flinkfinger nicht zu kurz, denn überall tummeln sich Baller-Schlangen, Flug-Schweine und andere Gegner, die bei Berührung ebenso am Lebenssaft zehren wie ein tiefer Sturz von Plattformen. Nur gut, daß es nicht an Bonusblöcken voller Extraleben. Zusatzenergie oder Wurfgeschosse mangelt! Während des gesamten Spiels sind praktisch keine Unterschiede zur Originalversion zu entdecken. Steuerung und Gameplay kommt genauso flott und fesselnd rüber, und in Sachen Optik sind ebenfalls kaum Abstriche zu machen. Na schön, das Scrolling in alle Himmelsrichtungen ist am Amiga vielleicht nicht ganz so weich, dafür sind die abwechslungsreichen Backgrounds kunterbunt gestaltet und die Sprites flott animiert. Nur die Begleitmusik nervt auf Dauer, und zumindest unser Testexemplar mußte noch ohne Sound-FX auskommen. Schwamm drüber, denn die Ladezeiten fallen angenehm kurz aus, und versteckte Geheimräume erfreuen den Mäuse-Killer ebenso wie praktische Levelcodes. Jolly clowns, dirty rats and the world according to Bart. Look, what's this bloody game actually called? On the NES, Gameboy etc. it's Krusty's Fun House. On the Super Nintendo it's exactly the same game but it's called Krusty's Super Fun House, for the perfectly acceptable reason that, by some bizarre law, every game every released on the Super Nintendo has to have the word 'Super' in the title somewhere. The Amiga version is exactly the game as every other one, but it gets a 'Super' as well, despite there nothing in any way remotely 'Super' about it as opposed to the pain old Krusty's Fun House jobs. Yep, I'm struggling a bit for investigative outrage this month, but it's stupidly irritating all the same. Sticking a gratuitous superlative onto something's name doesn't actually make it the least bit better - it's something we don't hold with here at SUPER AMIGA MEGAPOWER, so let's have less of it, okay? In Krusty's Super Fun House you take on the persona of Krusty the Klown, circus icon and hero of one Bart Simpson. Unfortunately, he's an icon with a problem - his Fun House is full of mischievous rats and he's got to get rid of 'em. Easy, you might think - just give 'em some chocolate bits of carrot, get their trust, learn to treat them as friends and ask them politely if they wouldn't mind keeping their heads down when the customers arrive. No problem. Well, that's what I do, but not Krusty - he enlists the help of the starstruck Simpson and his family, and sets out to kill the furry little loves. (Disease-ridden filthy rodent scum. - Ed). To be honest, I'm completely the wrong person to be reviewing this game. Most of the time when you're playing something, you identify with your character, you help him through his struggles, and you get a warm rewarding glow of satisfaction when you achieve one of his goals. 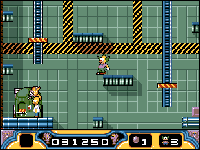 Playing Krusty's 'Super' Fun House, though, all I could think of was that if I worked out the solution to a particular level, lots of lovely little rats were going to get horribly murdered, and it really shot my motivation to bits. Still, life, eh? Ever the professional, I plugged away all the same. After all, I did manage to play the Super Nintendo version quite a bit (by pretending that the rats were actually hamsters or guinea pigs or some other crap rodent) and found it to be pretty entertaining (for a while at least), so it wasn't too difficult to bear. This is relevant, of course, because the Super Nintendo and Amiga versions of the game are completely indistinguishable from each other, so if you've already seen the SNES one, you don't need this review. Er, go and watch TV or something. Actually, that's not completely true. When the Amiga's Krusty scrolls either horizontally or vertically, it's smoother than the cream in, er, a cream cake, but when it tries both at once (like when Krusty walks diagonally up some stairs) you can really see the cracks in the programming - there's a nasty judder which, when combined with the garish, complex-patterned parallax-scrolling backdrops, can make for some real visual torture. Still, diagonal scrolling isn't something there's that much call for in the game, so it's not a serious flaw or anything, it's just a bit crap. What's more of a serious flaw is the game's password system. Krusty's Super Fun House is divided into 5 levels. Each level consists of a number of individual stages (there are 60 stages overall) which can be tackled in any order, except that in some instances,some of the stages are inaccessible until you've completed a certain section of another stage. Now all this is fine and dandy, but you don't get a password until you've completed an entire level. This isn't a problem at first, but after level one you find that you've seen pretty much everything the game's got to offer. This wouldn't be so bad but for the fact that you have to do so much at a time before you get another password. When I started playing, I zipped through level one, fairly enjoying myself, then got to level two (logically enough). I made speedy progress, largely because I knew what I was doing on most of the screens (from playing the SNES game), but by about three quarters of the way through I'd got to a point where I was so frustrated and annoyed with the game (I'll come to exactly why in a minute) that I'd have done almost anything at that point except continue playing. Unfortunately I couldn't stop, or all the time and effort expended in completing the previous seven stages would have been completely wasted, so I had to keep at it, with the result that I gradually began to utterly detest the bloody thing. A password even half-way through the level would have made it a hundred times more bearable. So what was it that was so frustrating, then? Well, it's like this. The levels of the Fun House are pretty sizeable chaps, and it's not always easy to see what's going on in them without an awful lot of trekking around exploring. This gets to be a bit silly by the middle of level two, when there are loads of pipes all over the shop, disappearing off the screen in areas you can't actually get to without trailing all the way round the stage. Of course, when you've done that, you can't see the bits where the pipes start, and they all look the same so you can't tell 'em apart, so you forget which one you were trying to follow, and you have to do it all over again. The challenge in this game is in trying to work out how to circumnavigate each problem, it shouldn't be in trying to see exactly what the problem is in the first place. A map facility wouldn't have actually made the stages easier to solve, but it would have made the game a whole lot friendlier to play. As it is, you get disillusioned and annoyed, rather than just perplexed, and the game's appeal diminishes rapidly. So that's the traditional griping over with, how about a bit of critical balance? Well, there's no denying that this is a fun game to play, and most of the puzzles are actually really well thought-out once you manage to ascertain what they actually are. It's just a shame that, for the sake of a couple of tiny little additions, what could have been one of the best puzzle games around gets relegated to the 'sadly flawed' stakes instead. I really hate it when that happens. 1. Here in the very simple first level (you're seeing almost all of it here), we meet a Simpson for the first time, as Bart gets his big boxing glove out. 2. Level two introduces the big air vents which blow the rats all over the place. Luckily, you can block them off, or even pick them up. 3. ...while in the third stage you get your first experience with the pipes which only the rats can fit inside. A real pain to navigate later. 4. Phew, only one more stage before we can go through that padlocked exit door at the end. But where have all the rats gone? 5. Oh no, it's getting really complicated now... lifts and everything. I really can't cope with it all, it's just too muc! Help! Help! 6. 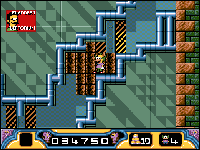 This stage conceals the means to enter the bonus section (that bit over to the right). Find the magic ball and go for a bit of an explore. 7. This is a mysteriously snake-filled secret level that you can only reach when you've completed level three. At first this is really nice to play, but it doesn't take nearly as long as it should to become pretty tiresome. Good fun to pick up now and again, but the passwords are just a little too far apart for that. UPPERS Lovely bright graphics, and some cleverly brain-teasing puzzles mixed up well with moderately demanding platform-leaping. Krusty's laugh is sweet, too. DOWNERS Some jerky scrolling, and the gameplay gets very repetitive and frustrating by halfway through the second level. Having to traipse around for hours just to find the layout of each level is a real pain - a map facility would have made all the difference, as would a two-button joystick option to avoid having to jump with 'up', which doesn't work as well as it should. And rats are lovely.